From spectacular villas in the South of France to majestic mountains and amazing wine country getaways, France offers couples a great choice of things to see and do. Our list of 20 Best Romantic Getaways in France focuses on trips outside of Paris: mountain hideaways, unique cruises and coastal escapes. 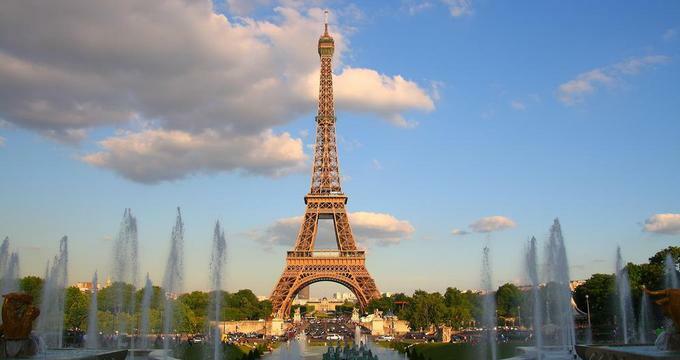 If you are looking for amazing places to stay in Paris, browse the Top Luxury Hotels in Paris and Best Honeymoon Ideas. Hameau Albert 1er is located in the beautiful mountain town of Chamonix, famous for its skiing in the winter and hiking in the summer. Plan a summer mountain getaway to the French mountains and stay at this stylish hotel. The property has an indoor and an outdoor swimming pool as well as Le Bachal Spa, sauna, whirlpool and a fitness room. The gourmet food at the hotel is the perfect complement to the amazing mountain surroundings and world class skiing. The restaurant has a wine cellar of more than 20,000 bottles. Hotel rooms have views of either Mont Blanc or the garden. The independent chalets which are great for honeymooners who want more space and privacy. The 21 rooms in the main building have Mont Blanc range or garden views. La Ferme building houses 12 rooms featuring wooden and historic architecture. Chalet Soli can accommodate 2 to 6 guests. It is situated within the resort grounds and measures 80 square meters. Guests enjoy authentic decor reminiscent of a hunter's cottage. The terrace has great views of Mont Blanc and is perfect for a small gathering of friends and family. Chalet Grepon can accommodate two adults and two children. There is a beautiful double room with wood burning stove, a private terrace with a panoramic view of Chamonix, and a small room with a bunkbed. Rates start at €160 per night. Chamonix is easy to get to by train or by car. There are buses from Geneva airport as well (+33(0)4 50 53 05 09). 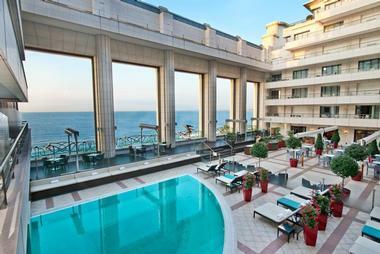 Hyatt Regency Nice Palais de la Mediterranee is a grand hotel located on the French Riviera in the center of Nice. Guests can swim in the indoor and an outdoor swimming pool, work out at the fitness center, gamble at the casino, and relax in the Turkish baths. The property overlooks the Mediterranean sea and is close to the beach. There are 188 rooms including 12 suites. Most rooms have a large balcony with panoramic views of the sea, the hills of Nice, or the gardens of the hotel's inner patio. Enjoy meals that mix Mediterranean and oriental flavors. Dine on the poolside terrace at Padouk restaurant. The Pingala Bar will satisfy small appetites and and quench your thirst with drinks prepared in individual mini shakers. Fly into Nice International Airport and then take a taxi directly to the property. Rates start from €280 to €680 for a single or double room; and from €1,100 to €2,000 for a suite (+33 (0) 4 92 14 77 00). Hotel Majestic Barriere is among the finest hotels on the French Riviera. 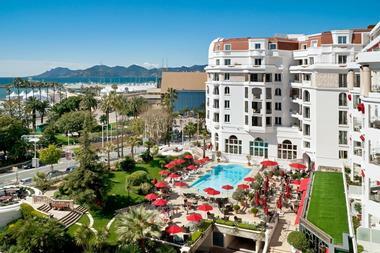 Famous celebrities often stay here during the Cannes International Film Festival. The hotel has a private beach with a choice of watersports, outdoor pool, spa and fitness center. If you are planning a special celebration with friends and family, book the Private Projection Room. The landmark property is near the main attractions in Cannes, and just 5 kilometers from the Cannes-Mandelieu Airport. There are 181 rooms and 84 suites at hotel, each of them elegantly styled with red velvet on the sofa and silk on the walls. The two penthouses are among the most lavish accommodations in town. Book a Junior Suite with a Sea View Terrace which will let you enjoy spectacular ocean views. Another great option is the Superior Sea View Room or the Delux Sea View Room, both of which face the ocean. The Christian Dior Suite is a celebrity favorite. Inside the suite, you will find Chevron hardwood floors and bright red cushions which are the same as those designed by Christian Dior in 1947. There are three restaurants which serve mouth-watering local specialties and international cuisine in different settings. Choices include Fouquet's Cannes, B Sud, and the La Petite Maison de Nicole. B Sud is the beach restaurant with the most impressive ocean views. Rotonde Louise Pommery is the champagne bar serving many options to their guests. There is also the Gallery Bar in Fouquet's with its traditional lounge armchairs and bar stools. Guests can order champagne, delicious cocktails and tea at any time of the day. Spa My Blend by Clarins is the place to relax with a massage and take advantage of the spa's plush amenities, including the steam room, sauna, fitness center and relaxation lounge. The spa has four treatment rooms which are large enough to accommodate couples' treatments. If you are planning a family trip, the hotel offers Diwi & Co kid's club for kids ages 4 to 12 years old. Activities include poetry, cooking, costume making and sculpture workshops. Rates start at 165 Euro but tend to be much higher in the summer season. Saint Tropez in the South of France is a popular celebrity vacation destination, offering beautiful ocean views, great shopping and awesome restaurants. Stay at Hotel Byblos Saint-Tropez which has 51 guest rooms and 45 suites, a European spa and a nightclub. The hotel has a stylish outdoor pool where you can spend your days basking in the sunlight. Rent the hotel yacht Algandra and explore the Golden Islands, Monaco and other gems of the French Riviera. Spa Sisley offers a menu of rejuvenating services inspired by European and international traditions. Try one of the classical massages or experience the power of aromatherapy designed to renew the body and spirit. Spoon by Alain Ducasse is a gourmet restaurant serving Mediterranean dishes with inspiration from Italy and the French Riviera. Spoon serves an award-winning selection of French and international wines. Rates at the hotel start at 395 Euro per night. If you are planning a trip in the Bordeaux region, there are few finer places to stay than the 5-star Grand Hotel de Bordeaux & Spa. Located in the city center, the hotel has a European spa, luxury accommodations and great restaurants. The resort's neo-classical facade fronts the Grand Theatre at the center of the Golden Triangle, the principal spot of Bordeaux's historic district in France. The building's grand architecture reflects the cultured sophistication and elegance that the hotel offers to its visitors. Take a wine tour and discover the world-famous vineyards of Bordeaux. The Aquitaine area is home to several stately and charming French castles where vacationers can immerse themselves in the local history and culture. The hotel has 128 rooms and 22 suites, built using Bordeaux stone and marble, and adorned with 18th century-inspired fixtures and fabrics. Book one of the Executive Rooms with views of central Bordeaux, Place de la Comedie and Bordeaux Opera. The Michelin-starred Le Pressoir d'Argent Restaurant is not to be missed on your romantic wine country getaway. Chefs cook a menu of classic seafood in front diners. Le Bordeaux Brasserie serves traditional French cuisine and local delicacies. The glass-roofed winter garden Orangerie serves casual meals, international tea and coffee. The English-style Victor Bar is where you can share afternoon cocktails and a great list of champagnes, whiskeys and vintages with the company of friends and family. The VIP corner is a perfect spot for exclusive gatherings while the club's resident DJ plays lively music. Visit the relaxing spa after a day of exploring the French wine country. Le Bains de Lea Nuxe Spa is located on the top three floors of the hotel with scenic views of the city and the Grand Theater. 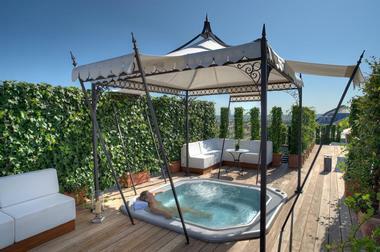 The panoramic Jacuzzi terrace is the perfect spot for relaxing with views of the city. The spa has ten healing rooms including three wet treatment cabins and offers a range of spa services inspired by ancient Roman baths. The hotel boasts of a thousand square meters of event space with seven salons and four foyers. The resort can accommodate weddings and receptions of up to 250 people. The hotel provides a beautiful and unforgettable setting for a romantic wine country wedding. Room rates start at 297 Euro per night (+33(0)5 57 30 44 44). 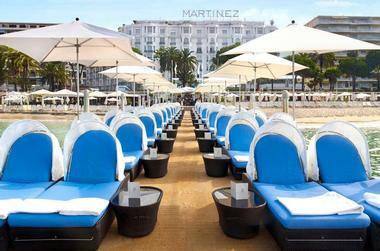 The Hotel Martinez is a luxury hotel in the heart of Cannes, featuring an outdoor heated pool, a spa and a private beach with a pier for sunbathing. The hotel is especially popular in the summer, so be sure to book your stay early. There are 415 luxury rooms with soundproofing, air-conditioning, safe, mini bar, plasma TV, and a DVD-CD player. The rooms are filled with signed furniture, works of art, paintings and sculptures from the thirties. The bathrooms have marble walls, a bath and separate shower (in most rooms). The panoramic suites have a hydro-massage system and a private sauna. For the ultimate in luxury, consider the two apartments and eleven junior suites located on the seventh floor of the hotel. The apartments and suites feature teak furniture, open-air Jacuzzis, roof gardens and olive trees. Enjoy an excellent dinner and a view of the bay of Cannes at La Palme d'Or. Le Relais Martinez is a chic and relaxed restaurant that specializes in Mediterranean cuisine, focusing on seafood and local produce. Espace Zplage is an open-air bar-restaurant located near the beach area, which has fireworks displays during the summer. There is also a room service menu as well as delivery from any of the hotel's restaurants. The property is 30 minutes from the Nice international airport. Room rates start at 260 Euro from January to April. In August, the busiest month, rates start at 500 Euro per night (+33 (0)4 92 98 73 00). Plan a relaxing trip to St Tropez and stay at the stylish Chateau de la Messardiere, set on 25 lush acres near the center of Saint-Tropez. Stroll through the hotel's beautiful Mediterranean gardens abundant with Provencal and Mediterranean flowers and plants. The hotel is a member of the French Bird Protection League. Ask for a Prestige Room for best views of the sea. Each of these rooms has a large private terrace, bathroom with a whirlpool bath, separate shower and double sink. If you want a view vineyards ask for a West Indies Room which overlooks both the vineyards and the fragrant gardens. The nearly-Olympic size pool at the chateau offers stunning views of the bay. The spacious outdoor pool deck has plush lounge chairs and umbrellas. The indoor pool is close to a large gym and separate ladies and men's steam rooms. The property has a beautiful private beach reachable via free shuttle service. Enjoy sunbathing, swimming and a variety of watersports. The hotel houses a permanent collection by Victoire de la Messardiere, whose ancestors built the original Chateau in the 19th century. During the summer season, the property hosts exhibitions by internationally-acclaimed artists. The restaurant serves refined and creative Mediterranean-style cuisine. Ask for a table outdoors on the terrace overlooking the beaches of Pampelonne. Room rates start at 500 Euro per night (+33 (0)4 94 56 76 00). If you have always wanted to live in a grand villa with a view of the ocean then Villa Mauresque is for you. The property is located on the Cote d'Azur in the South of France between Cannes and St Tropez and consists of two villas: villa Le Palais and villa Le Jardins. The beach is about 50 meters from the main building, where guests can enjoy water-skiing, kayaking, canoeing, wind surfing, and sailing. The property has two swimming pools and two jacuzzis, surrounded by manicured gardens. Guests can receive relaxing massages with views of the sea. Rooms have a Moorish feel with high ceilings and grand windows, some overlooking the Bay of St Tropez. The rooms are air-conditioned and the bathrooms have a shower and/or jacuzzi. Choose from four suites and 7 luxury guest rooms which have been renovated in 2013. Guests receive a large breakfast and room service. There are numerous restaurants available nearby for lunch and dinner. The property is 30 minutes from Cannes and St. Tropez. A taxi ride from Nice Airport will take approximately 45 minutes and cost between 100 and 150 Euro. Guest rooms start at 117 Euro per night (+33 (0)6 11 91 29 13). 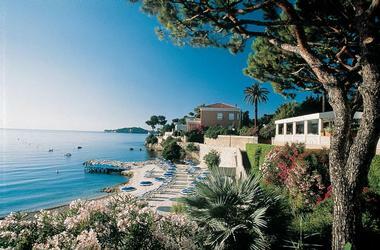 Hotel Royal Riviera is a Grande Dame of the Cote d'Azur, located in Saint-Jean-Cap-Ferrat, France, between Monaco and Nice. One of the few hotels with a private beach in this area, the hotel also has a heated freshwater swimming pool, beautiful gardens and a spa. The hotel is all about glamor, from its spacious lobby to the Grand Salon with high ceilings and classical wall paintings. From May through early October, guests have access to a selection of watersports. Explore the shoreline by boat, go parasailing and jet skiing. The spa has two massage rooms and offers a selection of therapeutic services. The best place for a massage is the new Treatment Pavilion, surrounded by palm trees and hotel gardens. Book a relaxing treatment before you arrive on your summer beach vacation at the hotel. Visit Monaco or Nice on your summer vacation, a 20-minutes drive, have fun at a casino, and play golf on one of the courses in the area. Saint-Jean-Cap-Ferrat with its cafes and shops is a must-see, and only a 15-minute walk from the hotel. There are 77 spacious guest rooms and suites in the main building, furnished in a neo-Hellenic style. Ask for one of the rooms with scenic views of the sea. Two luxury suites with private terraces and 14 rooms are situated in L'Orangerie, surrounded by the garden and decorated with lavender and orange tones. Dining is a special treat because of the restaurant's incredible views of the Mediterranean sea from the Panorama Terrasse. The delicious daily-changing menu is based on fresh local produce. Fly to Nice International Airport which is about 25 minutes away. Room rates start at € 200 in winter; from € 315 in summer (+33-4-9376-3100). Head to the South of France to enjoy great food, spectacular views and romantic accommodations at the Villa Gallici Hotel. Situated in a 18th century house, the property is surrounded by a beautiful garden complete with a swimming pool and an outdoor restaurant. There are 22 romantic rooms and suites that overlook a fragrant garden. Guest accommodations are decorated in classical style with plush pillows, unique paintings and murals. The restaurant serves delicious dishes inspired by Provence, including butter fried scallops, fine saffron gelly with lemon pepper and Parmesan slices. In the summer, dine outdoors surrounded by fragrant plants and romantic views. Room rates start at 230 Euro per night (+33 (0)4 42 23 29 23). 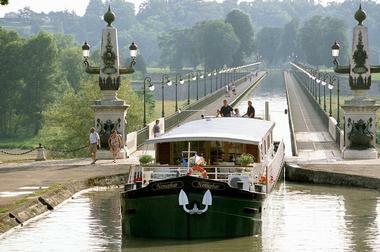 Cruise in the heart of provincial France aboard one of the four luxury barges operated by French Country Waterways. The elegantly furnished barges can accommodate only eight to 18 passengers, providing an intimate cruising experience. Travelers can choose from various itineraries: Burgundy, the Upper Loire Valley, Champagne and Alsace-Lorraine. Itineraries last six nights and depart on Sundays from the end of March through October. The barges have a feel of a country inn, featuring warm wood paneling, comfortable sofas and chairs, books, games, and music. Each vessel is fully air-conditioned, with individual controls in every stateroom. In 2015, all-inclusive rates start from $4,195 per person, double occupancy. The price includes all meals, estate-bottled wines at lunch and dinner, open bar, full use of facilities, daily tours and excursions, private wine tasting, bicycles, services of the crew and transfers (800-222-1236, 781-934-2454). 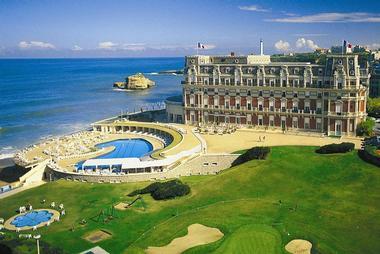 Hotel du Palais is one of Europe's grand hotels, located in the seaside city of Biarritz in southwestern France. Ask for a room or a suite with a view of the Atlantic Ocean. Choose from Classic Rooms featuring Basque architecture and views of the Grand Plage, Prestige overlooking the city and the Atlantic Ocean, and Junior Suites with lavish furnishings and ocean vistas. The Residential Suites are furnished in grand style and offer state-of-the-art amenities. The Imperial Suites, named after famous guests, are the plushes of all accommodations. La Rotonde offers ocean views and serves Basque cuisine. Villa Eugenie is a Michelin-starred restaurant serving the freshest seafood and regional dishes with views of the countryside and the ocean. An array of seafood dishes, salads and desserts are served at the causual Hippocame restaurant with views of the bay. Le Salon Eugenie is a soothing lounge where guests are refreshed with herbal tea and energy-boosting drinks while breathing in fresh ocean air on the terrace. Spread over five floors, Le Spa Imperial is the ultimate wellness complex for pampering and relaxation. Massages and body spa treatments are offered at the Guerlain Spa. The Leonor Greyl Hair Care Institute is the complex's exclusive salon for beauty and hair styling. Facilities include an indoor pool, Jacuzzi, steam rooms, saunas and sun loungers. The fitness center is equipped with the latest exercise equipment. Guests can play golf on one of the premier courses in the area. The nearest, five kilometers away, is the 18-hole, par-72, 6,677-yard Arcangues Golf Course, built on 198 acres of rolling terrain lined with old oak trees with views of the Basque countryside and the Pyrenees. Other noteworthy courses are Biarritz Le Phare, Golf de Moliets and Seignosse. The hotel provides customized recreational activities for families and friends traveling together. Schedule a visit at a village trinquet (pelote hall) for a game of pelote and take the Petit Train de La Rhune to capture views of the Pyrenees. Children can learn about sea ecology at the Cite de'Ocean and indulge in fun-filled activities in the Children's Club and the hotel's outdoor playground. The property can accommodate weddings of 12 to 230 guests in its six venues. The hotel is a 7-minute drive from Biarritz Parme Airport in France. If you decide to visit the charming village of Saint Paul de Vance on your romantic getaway to France, stay at Hotel Le Saint Paul. You will spend your time enjoying fine food and wine while exploring the town, which is a maze of narrow streets, stone houses, art galleries and shops. Choose from 19 rooms including 4 small apartments. The rooms are air-conditioned and have private bathrooms, television, and mini-bar. The restaurant has an indoor dining room as well as a romantic outdoor terrace. Breakfast is a special time and can be served on your private terrace or on the restaurant's terrace with a view. The town is 15 minutes from Nice International airport, between Cannes and Monaco. You can rent a car at the airport which will give you the flexibility to explore the countryside. VacationIdea.com Travel Tip: Check for honeymoon packages. Rates range from €170 for a standard single room to €580 for a Deluxe Suite. Located in the French Alps, 55 minutes from Geneva, Les Fermes de Marie has been restored from traditional farms to a luxury mountain hideaway. The property is a gem for those wanting to relieve the stress of city life and get closer to nature. The hotel is full of features that show attention to detail: from hand-picked wooden furniture, fabrics, art and a private hotel vegetable garden. Guests get to enjoy the simple pleasures of life. Start your day with a breakfast on the terrace, have tea in the library in front of a fireplace, and get pampered at the Ferme de Beautè, the Beauty Farm. The spa offers a number of treatments and its own line of beauty products. Relax by the swimming pool, in the sauna, Jacuzzi or Turkish bath. Guests can choose from many packages massage, shiatsu, reflexology, algae wraps and lymphatic drainage. The property is a complex of eight traditional French farms, meticulously restored and decorated. The guest rooms feature traditional fabrics and hand-picked wooden furniture. There are also several small private chalets. Dining is certainly a delight. The signature restaurant serves local dishes, incorporating the freshest seasonal ingredients. Guests can also dine at the Rotisserie and at the cheese specialty restaurant. Megeve is a charming mountain town with unique atmosphere, warm hospitality and country charm. Nearby activities include hiking, cable cars, mountain biking, tennis, shopping, skiing and golf at the Mont d'Arbois golf course. Megeve is about 55 minuted by car from Geneva International Airport or from the international railway station in Geneva. The closest train station is Sallanches, 7 miles away. Room rates from Euro 134, depending on the season. 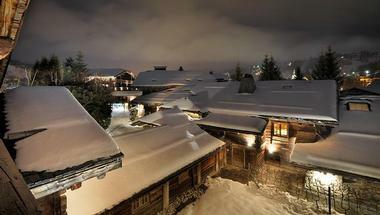 You can also stay at one of the hotel's sister properties in Megève (+33-4-5093-0310). 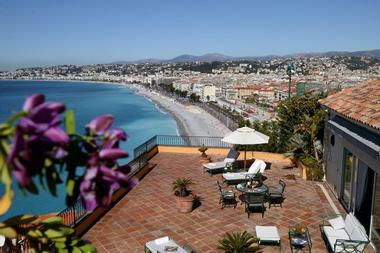 Hotel La Perouse is an oasis of calm with scenic views of the Baie des Anges in Nice. The property has a flowered terrace, an outdoor swimming pool, sauna, and a solarium terrace. Embrace a more relaxed pace of life while you sit by the pool sipping drinks and take in panoramic views of the sea. Tennis courts, water sports, markets, and night-clubs are all nearby if you are looking for more things to do. The fact that there are only 58 rooms and four suites, allows the property to retain the feel of a small luxury hotel while providing excellent service. Rooms are furnished in Provencal style with colorful fabrics, bathrooms with Boticino marble tiles, balcony or terrace, air-conditionning, Wi-Fi access. Ask for one of the sea view rooms which have private balconies and exceptional views across the Bay. 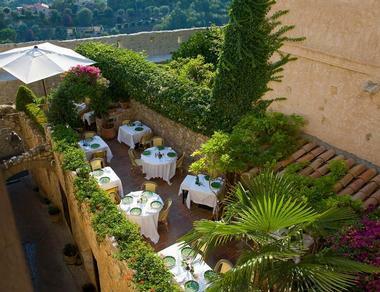 From May to September guests can dine on tasty Provencal cuisine on the terrace under the lemon trees. Enjoy a full buffet breakfast on the shaded terrace in the morning. Room service is available year-round from 7am to 11pm. The poolside bar is open all year long. The getaway is seven kilometers from Nice Airport, which should take about 20 minutes. Nice Train Station is ten minutes away. 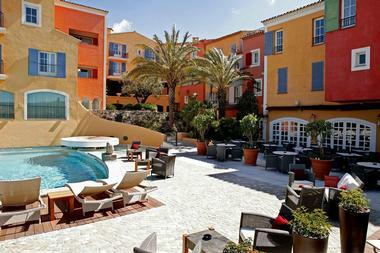 Rates a the Hotel La Perouse start at approximately €365 and vary according to season. The summer time is the most popular time of year and therefore is the most expensive time as well. Rates a the Hotel La Perouse start at approximately €365 and vary according to season. The summer time is the most popular time of year and therefore is the most expensive time as well (+33 (0)4 93 62 34 63). 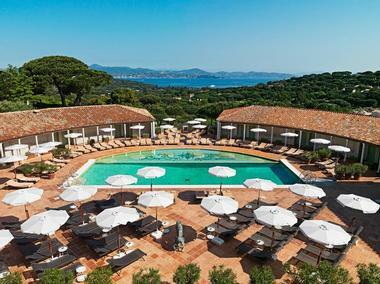 Villa Marie is a romantic luxury getaway in Saint Tropez. Guests can choose from 42 stylish guest bedrooms decorated with subtle pastel shades and Florentine furniture. Ask for a view of the ocean when booking your stay. The hotel has an outdoor swimming pool and beautiful gardens, filled with aromatic herbs and citrus fruit. That's why the hotel spa offers outdoor massages that let you enjoy the fragrant gardens to the fullest. Book a relaxing massage at the spa or outdoors surrounded by nature. The Italian-style villa is set on seven acres with a pine forest overlooking the famous Saint-Tropez. While you are enjoying dinner at the restaurant, you can look out over the Bay of Pampelonne. There are several lounges and patios set up on the property to provide vacationers with plenty of space for relaxation. At the Orange Lounge you will be surrounded by huge terracotta jars, Florentine furniture and a fireplace decorated with seashells. 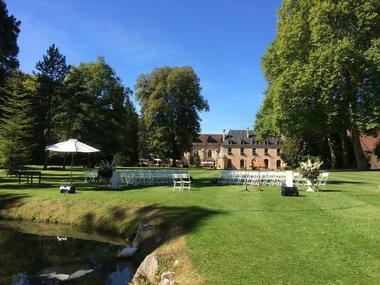 Tour the scenic wine country while staying at the elegant Abbaye de la Bussiere. The hotel offers uniquely furnished guest rooms with scenic park and lake views. Guest accommodations are furnished in French style and offer bathrooms with a whirlpool bath. Each piece of furniture placed in the rooms is hand-picked. Several luxury suites are offered, including the romantic Ermitage which has a vaulted ceiling linking the bedroom and the living room area. Tones of white, red and black create a very romantic setting. Trizay suite with its elaborate golden headboard is another great choice for couples. The restaurant serves gourmet dishes paired with some of the top regional and international wines. Explore the beautiful wine growing region while sampling delicious wine. The hotel can organize exclusive wine tastings for its guests at wineries in the area. Room rates start at 205 Euro per night. 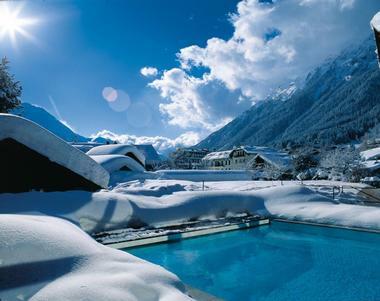 The luxury Hotel de Charme Les Airelles is located on the slopes of Courchevel. 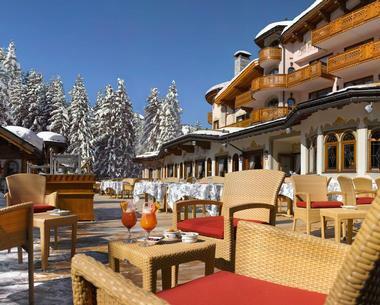 The property showcases Austro-Hungarian glamor and gives guests easy access the largest ski area in the world. It is the perfect place for lovers of winter activities and snow sports. 37 rooms and 14 suites offer vacationers the ultimate comfort and cutting edge amenities. Nestled on the topmost floor is the 5,920 square foot (550 square meter) elegant Private Apartment. La Table du Jardin Alpin creates dishes and desserts faithful to traditional and genuine "cuisine bourgeoise." At Le Coin Savoyard, regional specialties are prepared using the best cheeses and meat cooked on an open wood fire. Sample the finest liqueurs and the rarest spirits or enjoy an afternoon tea at the Bar Les Airelles. You can try Havana "puros" cigars accompanied by a fine aged spirit in its smoking room. he lounge has a library and a cozy fireplace. The spa offers the global SwissCellSpa experience. It lets you try cellular revitalization and other wellness therapies like the Cellcosmet and Cellmen face and body treatments. There are separate treatment programs for ladies and gentlemen served by teams of beauty therapists. Everything is designed around the pleasure of skiing freely in the splendor of wide open spaces. Comprehensive skiing services include valets, ski rooms and technicians. A Kingdom Just for Kids has two mascots, Lorelei and Jeff, entertain kids with a fortified castle, a giant screen cinema, ultra modern video game arcade and various other activities. The Airelles Theme Evenings is a tradition to look forward to among families especially during Christmas, International Women's Day, Carnival and Easter events. The property is a beautiful venue for exchanging your vows. Its Alpine fairy tale-like exterior overlooking the snow-capped mountains of the ski resort is the perfect place to say "I do". Room rates start at 1,100 Euro per night (+33 (0)479 00 38 38).